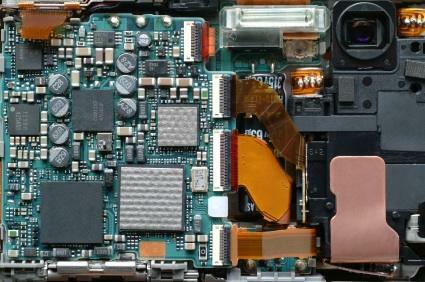 Understand the guts of a digital camera. Have you ever stopped while taking pictures and suddenly wondered, "Digital cameras: How do they work?" Like many contemporary technological gizmos, digital cameras are so amazing that it seems like magic is the only explanation for all the things they can do. However, as with most things, there is a logical explanation, and magic has nothing to do with it. This article will give you a look at what goes on behind the viewfinder and will help you answer the question, "Digital cameras: How do they work?" Understanding Digital Cameras: How Do They Work? Even though a digital camera looks remarkably like its film counterpart, it could not be more different in the way it functions. Film cameras operate by allowing light to hit a piece of film and chemically imprint an image on it; they can literally be made with a piece of film and a box with a hole cut in it. Digital cameras, however, don't work the same way. Each one works like a small computer. The fundamental element of a digital image is its pixel rate. Pixels are tiny dots of light that are represented in bits and bytes, or a string of zeros and ones that computers read. Whereas a film camera allows light to pass through a lens and fall on a piece of film, digital cameras take the same light and focus it on a semiconductor that records the light in a series of pixels. Depending on how sensitive the semiconductor is, and how powerful the camera is, the number of pixels will vary. The resolution of the camera is measured by its numbers of pixels. A low-end camera might be a 1.3 megapixel (meaning 1.3 million pixels) while a professional camera can be as high as 15 megapixels. The sensors that cameras use to convert light into electricity (electrons) are one of two types: charge coupled device (CCD) or complementary metal oxide semiconductor (CMOS). While they both do essentially the same thing, on a technical level they perform these tasks in very different ways that create certain pros and cons for each type. CCD sensors have been around longer and can typically produce images with higher pixel rates and less noise, but CMOS sensors use much less power. When a digital camera captures light and converts it into electricity, it still hasn't captured any of the image's color. This is accomplished by an entirely different process called filtering. In most digital cameras, a beam splitter redirects light as it enters the camera to three different filters designed to look at light through one of the three primary colors: red, green, and blue. The camera records how these three filters read the colors of the light and then blends the results into one image that is color accurate. Much like conventional film cameras, digital cameras rely on aperture and shutter speed to control the amount of light that enters the camera. The aperture refers to the size of the opening that lets light into the camera. The lower the aperture number, the wider the opening, and the more light enters the camera. Shutter speed refers to how long the camera's shutter is open to let light into the camera. The faster the shutter speed, the less light enters the camera. Unlike a film camera, the shutter of a digital camera is digitally controlled, and is not mechanical. After the image is taken, the digital camera does one of its most computer-like tasks and saves the image to a storage medium as a file. Most cameras today can save images in several file formats including TIFF, JPEG, and RAW. Most cameras then compress these images to make them as small as possible and then record them to a removable storage device like an SD card or a Memory Stick. These cards can then be removed and connected to a desktop PC or a laptop where the images can be edited using [[Free GIMP Tutorials|image editing]] software. Like all aspects of technology, digital cameras are evolving at an exponential rate. The features that you can find in a camera that costs less than $200 today would have only been available in high-end professional models a few years ago. It's hard to imagine what digital cameras will look like in a few years, but there's no question that they will continue to surprise and amaze.